2013 foals arriving. Watch our website for photos and sale information. Im Going to Jackson will be shown in the 2013 show season. Watch for his accomplishments. We have several yearlings for sale that are ready to start training for yearling classes. See sale page. 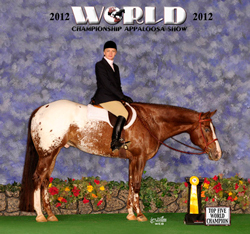 Join the North Dakota Appaloosa Horse Club at their annual open show in West Fargo, ND on August 17-18, 2013. This is a fun show and open to all breeds of horses and includes the highly popular Yearling Challenge with added cash prizes. Download the showbill. Show a Secret Admirer yearling at the Fall Classic and be eligible for our added prize money in the Secret Incentive. Thank you to everyone who have purchased horses in 2012.